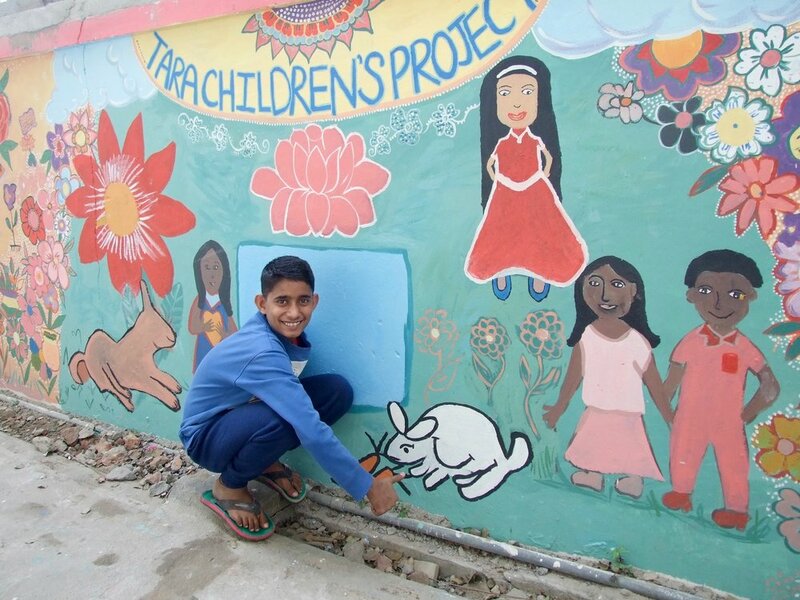 The children from the Tara Children's Project (TCP) recently worked collaboratively with arts therapist Karma Barnes to create a beautiful mural to enliven and beautify the entrance to TCP. The children developed the design of the mural based on themes from the 16 Guidelines and drawings from their imaginations. 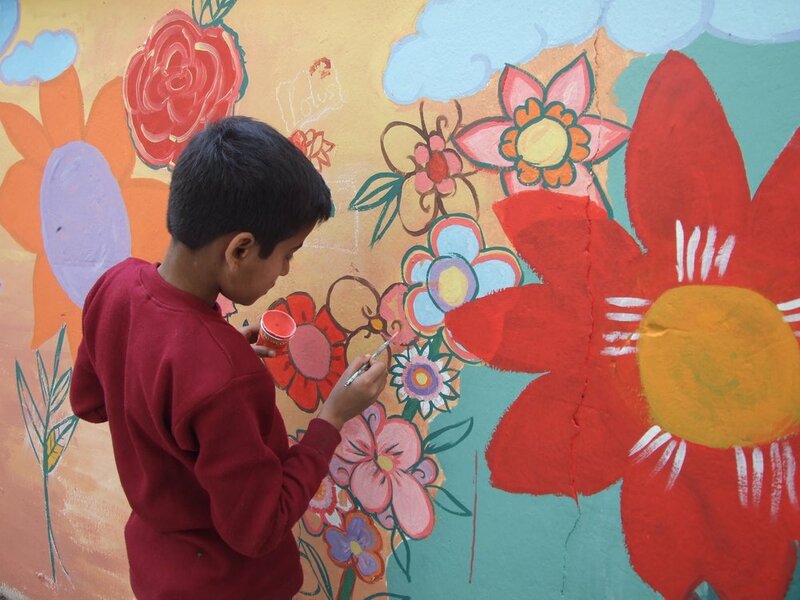 The mural was an opportunity for the kids to see their ideas come to life, explore ways of working with each other as well as overcoming challenges, learning new skills and delighting in expressing their ideas in colour and paint. 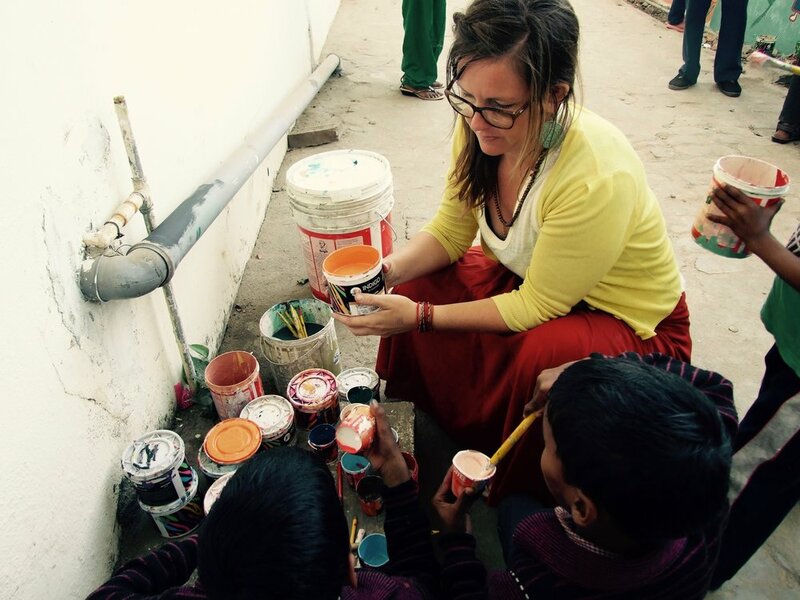 Karma is from Australasia where she works with young people both as an arts therapist and as a participatory artist, utilising street art and installation art as a method of facilitating people working together. The project took place over 8 sessions in January and February 2017. The project started with Karma working with the children to brainstorm and visually sketch what was important and meaningful to them, what they wanted to see in the entrance to the Tara Children's Project and what they thought visitors may like to see. These ideas included the 16 Guidelines, many local animals, children and flowers. Universal Education for Compassion and Wisdom is at the core of all the education at the Tara Children’s Project, so it was wonderful to see the Guidelines come to the forefront for the children when given their own space to articulate what brings life meaning for them. The next stage of the project was to put the background colours on the wall and then to start sketching their designs into a large-scale format. All the children from the TCP contributed to the project from 5-17 years of age. The children took to the wall with chalk to mark out their animals, self-portraits, the lettering and trees. We then decided how we were best going to be able to make a feature of the 16 Guidelines, the children decided to make giant flowers for each of the 4 wisdom themes and then place each set of four guide lines on the petals. As the children painted the guidelines Karma and TCP staff asked the children about what they thought was important about the Guideline, what they already do and what they could do to work with it in their lives. The children shared some stories about the importance of kindness, patience and courage from their lives. There was a lot of excitement and amazement from all the children in completing the mural. It has transformed what was a drab area into a vibrant and welcoming space that is educational and creatively invigorating. It is now a beautiful message to the children that they have the power to transform their lives. The director of The Root Institute said about the project "I am sure this was not only therapeutic and creative but it also taught them many skills in addition to helping them feel a sense of confidence and accomplishment in the work they did."